Image splicing detection is of fundamental importance in digital forensics and therefore has attracted increasing attention recently. In this article, a color image splicing detection approach is proposed based on Markov transition probability of quaternion component separation in quaternion discrete cosine transform (QDCT) domain and quaternion wavelet transform (QWT) domain. First, Markov features of the intra-block and inter-block between block QDCT coefficients are obtained from the real parts and three imaginary parts of QDCT coefficients, respectively. Then, additional Markov features are extracted from the luminance (Y) channel in the quaternion wavelet transform domain to characterize the dependency of position among quaternion wavelet sub-band coefficients. Finally, an ensemble classifier (EC) is exploited to classify the spliced and authentic color images. The experiment results demonstrate that the proposed approach can outperform some state-of-the-art methods. In recent years, with the rapid development of image editing software and processing technology, it has become easy to tamper digital images without leaving any visual trace. These tampered digital images can have a bad influence on people's lives if they are used maliciously. Therefore, the research on the effective identification of tampered images has drawn more and more attention, and some novel and effective detection methods have been proposed recently. 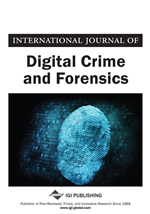 At present, the approaches of digital image authentication can be divided into two categories, referred to passive detection methods (Luo, Qu, Pan, & Huang, 2007; Elwin, Aditya, & Shankar, 2010; Birajdar & Mankar, 2013) and active detection methods (Vyas & Lunagaria, 2014; Panchal & Srivastava, 2015; Stamm, Wu, & Liu, 2013). Active detection methods embed specific information into digital image. When verifying the authenticity of images, the hidden information can be extracted from the suspicious images, and then compared with the original one. Compared with the active detection methods, passive detection methods can validate the authenticity of image without any prior information about the source image. So, it has attracted more and more attention recently. Although any visual trace will not be left in tampered images, image tampering operation would inevitably destroy the statistical characteristics of the original image. Based on this idea, lots of researches on variety of image tampering have been done (Xue, Ye, Lu, Liu & Li; Yang, Zhu, Huang, & Zhao; Ding, Zhu, Yang, Xie, & Shi; Yang, Zhu, Huang, &Zhao). The image splicing tampering and copy-move tampering are two common problems in image tampering. Copy-move tampering detection of image is to detect whether there exist two or more similar regions in a single image, and it will locate the similar regions when they exist. Recently, some novel methods about copy-move tampering detection are proposed (Yang, Li, Lu, & Weng, 2017; Li, Yang, Lu, & Sun, 2016; Chen, Lu, Ni, Sun, & Huang, 2013). Splicing tampering detection of image is to detect whether a source image is formed by splicing two or more images. (He, Lu, Sun, & Huang, 2012; Zhang, Lu, & Weng, 2016; Li, Ma, Xiao, Li, & Zhang, 2016). This paper mainly researches splicing tampering detection of digital image.